St. George’s remains the only Anglican church in Iraq. The current building dates from 1936, and the church initially served British diplomats, military personnel and expatriates. Shuttered under Saddam Hussein’s regime, the church was reopened by the Rev. 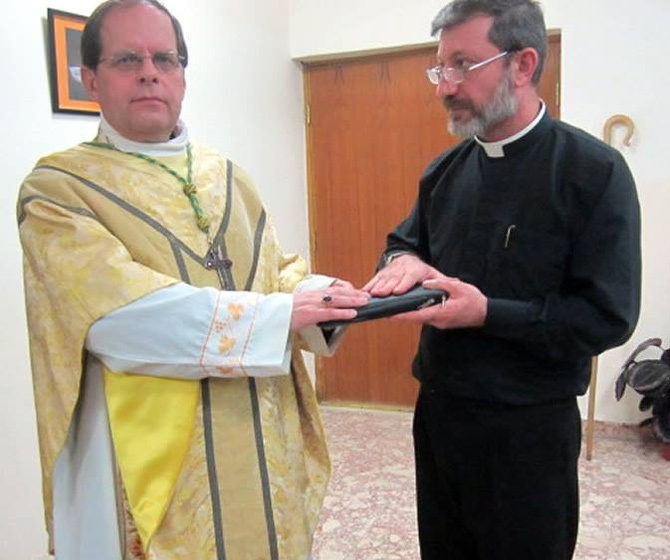 Canon Andrew White and eventually came to have an all-Iraqi congregation. Today, St. George’s is led by Iraq’s only ordained Anglican clergyman, Fr. Faiz Jerjees. Part of the Anglican Diocese of Cyprus and the Gulf, St. George’s conducts outreach ministries to the poor and needy, including widows, orphans and the sick. Since the rise of the so-called Islamic State, Baghdad has seen an influx of Internally Displaced Persons (IDPs), many of whom left everything behind as they fled their hometowns. The Mothers Union is active, and a food distribution program is in place. FRRME America provides financial support for the operations of St. George’s Church and its outreach efforts. The medical and dental clinic located on the grounds of St. George’s provides free health care and prescription drugs to people of all faiths and is supported by both FRRME America and FRRME. The Rt. Rev. Michael Lewis, Bishop of the Anglican Diocese of Cyprus and the Gulf (left) licensed Fr. Faiz Jerjees as the rector of St. George's Anglican Church in Baghdad in the summer of 2015. Fr. Faiz is the only native Iraqi ordained as an Anglican priest in Iraq.